The South Dakota State Historical Society Press is making the dispatches of Captain Jack Crawford available in paperback. Ho! For the Black Hills: Captain Jack Crawford Reports the Black Hills Gold Rush and Great Sioux War opens a window into a vibrant and chaotic time in western South Dakota. In his letters to an Omaha newspaper, John Wallace Crawford, better known as “Captain Jack,” wrote a vivid account of this fascinating time in the American West. He featured his adventures in the early Black Hills gold rush as he played the parts of reporter, plainsman, scout and raconteur. With an eye for the unusual and intriguing, Captain Jack informed his readers of the relative merits of the gulches, the difficulties of travel in the region, the art of survival in what was essentially wilderness, the hardships of inclement weather, trouble with outlaws and interactions with American Indians. Captain Jack met and worked with Buffalo Bill Cody and quickly seized the opportunity to scout for Brig. Gen. George Crook on his Indian campaign. Jack’s correspondence from the Starvation March and the fight at Slim Buttes offers detailed and intimate accounts of these dramatic episodes of the Great Sioux War. Award-winning historian Paul Hedren has compiled these almost-unknown letters, writing an introduction and essays that place the correspondence in historical context. The result is a treasure trove of primary documents as well as an exciting yarn in the traditions of the Old West. The hardcover edition of Ho! 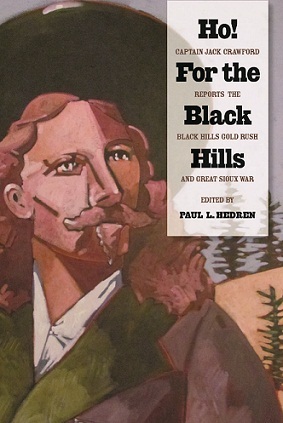 For the Black Hills has been praised as “fascinating” and “essential reading for all Black Hills enthusiasts.” It was also a finalist for the Western Writers of America’s prestigious Spur Award for Best Western Nonfiction Biography. The book is available through the website of the South Dakota State Historical Society Press, www.sdshspress.com, or through the Press’s office at (605) 773-6009.